Zhen Shilun, a 32-year-old adventurer from Baoding, Hebei province, is kayaking solo along China's 18,000 kilometers of coastline. "I am the first person to start this journey and will record on video all the exciting moments along the way," he said. The trip's purpose, he said, is learning to survive in natural conditions and with limited resources, and demonstrating this to people today. Zhen, who has been an outdoor enthusiast for more than a decade, underwent half a year of professional training and preparation for his expedition. His voyage began last year at the port city of Fangchenggang in the Guangxi Zhuang autonomous region, and he expects to reach Dandong in northeastern China's Liaoning province next year. "The journey will not be as quick as it could be, because I will go inland to explore whenever I stop for a rest," Zhen said, adding that he likes to record the traditional customs and scenery he encounters. The memorable moments captured may not all be good, however. "My first experience of getting lost came when my GPS broke down, and I had to ask passing fishermen for directions," he said. "While this was happening, I was also shooting pink dolphins in the water, as well as sea pigs wandering along the beaches of Guangxi." Zhen said he makes about 14,000 strokes during 10 hours of paddling each day. So far, he has covered 2,000 km. Though his parents have not opposed his adventures, they still worry a lot. "My mother once cried after one of my eyes was badly hurt in an accident during a cycling journey in 2013," Zhen said. "But whenever I start a new journey, they always support me, whether financially or spiritually." Setbacks, he conceded, are inevitable. "There have been times during a journey when I was extremely tired, wounded or lonely, and I wondered why I ever started," he said. At such times he said he would usually decide to "give up and go back home, find a job, and enjoy the safe, normal life that my parents expected". Yet the next morning after a good sleep and full of energy he would change his mind and continue. "I remembered why I started and all the wonderful things I had encountered," he said. "Experiencing the unexpected is the whole point." Now single, Zhen said he hopes to marry a like-minded woman. "I'd like us to explore new things together for 10 years, after which we can settle down," he said. "When we grow old, our experiences will be our treasure." 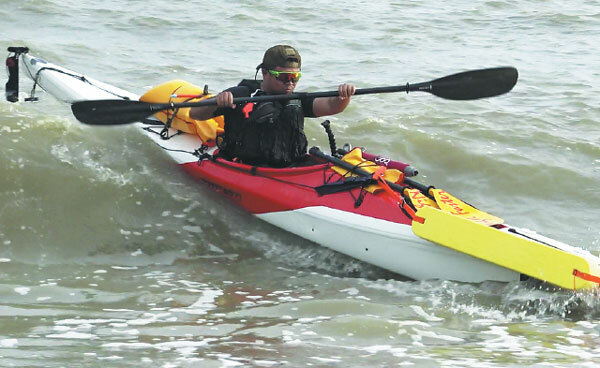 Zhen Shilun, a 32-year-old adventurer is kayaking solo along China's 18,000 kilometers of coastline.